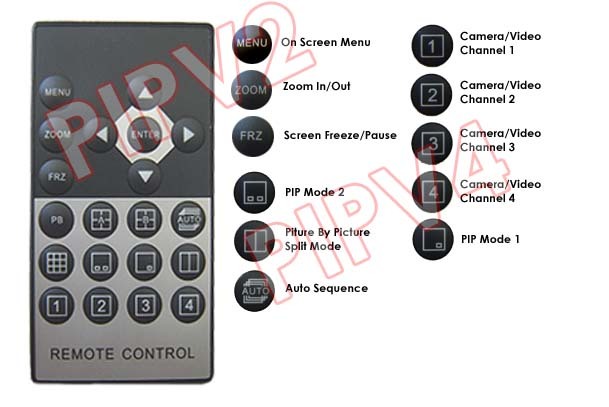 This PIP unit supports total of 4 standard video/audio inputs with 2 composite video outputs and 1 audio output. All video and audio inputs will be synchronized accurately so all camera feeds or other composite video feeds can be output simultaneously for smooth and sharp pictures without any glitch occurred. This split-screen processor itself is a stand alone unit and fully plug and play. No complicated configuration and very easy to be set up by users of all levels. The major setup will be hooking up video cables between the video sources and the display or video recorder. Once done, the operation will be controlled through the supplied IR remote or push buttons on the front panel. This quad PIP video processor supports audio inputs and output. There are total of 4 audio inputs in 3.5mm headphone style so each video input has its audio input channel to be associated with. 4 standard video inputs with 4 audio inputs. Each video input has its own associated audio input channel. Select any of the connected video/audio source inputs for output to TV monitor, external speakers or DVR for monitoring or recording. Easy and fast switching between video/audio inputs, split-screen modes by using IR remote control or push buttons on the front panel. If RCA input connectors are needed, please refer to our PIPV2RCA model.